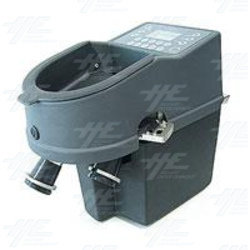 A coin counting machine that can count and compare any amount of coins or tokens. The unit comes with a graphical display to make operating the unit even easier. The output from the unit can give out set amounts of coins/tokens for bagging purposes. It will send all rejected coins into a secondary tube. The output from the unit can give out set amounts of coins/tokens for bagging purposes. It will send all rejected coins into a secondary tube.